Reading Lloyd Jones on Revival was a breath of fresh air. It was a good reminder that there is more to Christian experience than what we experience in our daily lives. We can know more of God than we do. One of the reasons that Christians don’t experience more of the joy of knowing Christ is that we are happy with what we have and don’t want more. To be honest most Christians don’t even know there is more to it, so they don’t look for anything better. But we can know God better. He can rend the heavens and come to meet with us, but we don’t ask for because we don’t know such a thing is possible. 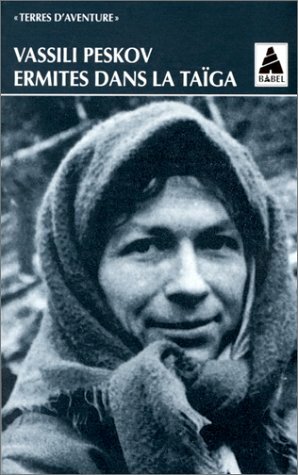 Just after reading Lloyd Jones, I read a book called “Lost in the Taiga“, by Russian author Vasily Peskov. I remember reading it when I was a teenager and it had quite en impact on me at the time. But it belonged to my Grandmother and probably got lost after she died. “Lost in the Taiga” is the true story of the Lykov Family. For 40 years, from 1938 to 1979, they lived in complete autarcy in the Siberian Taiga, without any contacts with the outside world from 1945 onwards. They were actively trying to escape the secular world which they saw as sinful. But a helicopter eventually saw their isba and the surrounding garden in the forest, and the world started coming to them. Can you imagine that? 40 years of surviving in one of the most hostile and unforgiving environment in the world! Their main diet was potatoes, turnip, dried meat when they could catch something once or twice a year (they didn’t have any weapons), pine seeds and fish. In the summer, they would forage for wild berries, and mushrooms. They also grew rye in small quantities. Some rodents had eaten their carrot seeds once, so they had disappeared from their diet. They did not have any animals for milk either. All this was cooked in on a primitive stove, without salt. To clothe themselves they grew hemp. After their first contacts with civilisation, they started receiving regular visits from the nearest geogical station which had been set up down the valley in the early 8Os. The nearest village was more than 200km away, without any roads or tracks to get there. They slowly started accepting gifts, as long as they go agains their very strict religious requirements. They discovered salt, rice, oats, honey… They had lived all these years without these things and were content with what they had. A few years later, there lives had improved thanks to their contacts with civilisation. They still remained convinced that the hermit’s lifestyle was the only proper way for a true christian, but they couldn’t live without salt nor the milk from the goat they had received as a gift, nor the eggs from their chicken or the other things they had discovered. They still rejected most food from the outside world as sinful, but what they had become used to the things they had accepted. They had discovered that there was more to life than what they had known until then, and were enjoying it.